The grapefruit is a citrus fruit originating from the West Indies in the 1700s. It is thought to be a cross between the orange and the shaddock. In addition to its delicious tangy taste, grapefruits offer several health benefits. When selecting a grapefruit, select a fruit that is glossy, round, smooth and heavy for its size. 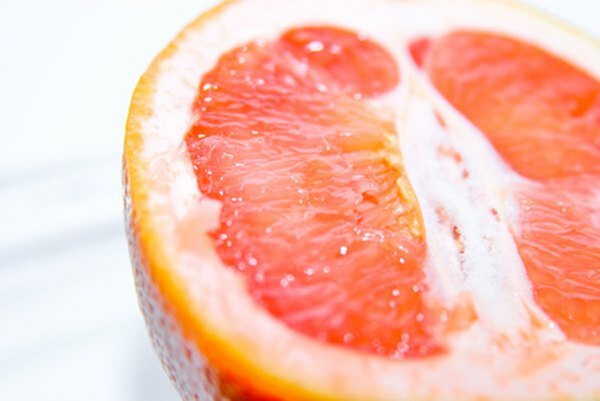 Grapefruit with brown or soft spots should be avoided. The benefits of grapefruits aren't limited to the actual fruit as many benefits are obtained from the grapefruit peel. In particular, these benefits are found in the compounds extracted from its peel. Among these benefits are anti-inflammatory-, antiseptic-, antioxidant- and cleansing properties. Grapefruit peels provide a natural and affordable alternative to over-the-counter products. Grapefruit peels contain the enzyme bromelain. Bromelain is a protein digesting enzyme that helps cleanse the skin by gently removing the older, upper layers of your skin. Rub the inside of the peel against your face as a cleanser. While removing older skin cells, the pH of your skin will also be balanced. This promotes softer, smoother skin that looks younger and fresher. After using grapefruit peel on the skin, it's important to wear sunscreen as your skin may be particularly sensitive to the sun. Grapefruit peels are a powerful anti-inflammatory. Grapefruit peels can be used to help reduce itching from skin conditions such a psoriasis. In addition, rubbing grapefruit peels over mosquito bites or inflamed skin can provide relief. The antiseptic properties of grapefruit peel can be used on cuts or scrapes. Using grapefruit peels will help protect against infection and tetanus. Like the fruit itself, grapefruit peel has antioxidant properties. Antioxidants are found in plants and slow or stop other molecules from oxidizing. When molecules oxidize, they can produce free radicals. Free radicals cause signs of aging and may play a role in chronic diseases such as cancer and cardiovascular disease. Grapefruit oil can be purchased in health food stores. Consuming grapefruit oil from the peel is the best way to benefit from the grapefruit's antioxidant properties.